Rosenholm Castle on Djursland was built by nobleman Jørgen Rosenkrantz in 1559 on the site of what had been a small manor house in the 15th century. Rosenholm has belonged to his descendants ever since but is now run by a foundation. Jørgen Rosenkrantz had the four-winged main building built in the renaissance style from 1559 until about 1600. The main building houses a wealth of portraits, tapestries and furniture collected by generations of owners. The park features a renaissance-style summerhouse called Pirkentavl. A children's Christmas TV show from 1986 was filmed at the castle. Rosenholm is open in the summer. 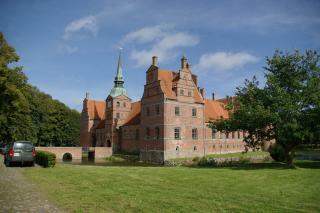 The best-known owner of Rosenholm was Holger the Scholar" Rosenkrantz (1577-1642). A child prodigy, as an adult he ran an unofficial school at Rosenholm, now called Jutland's first university. He had a top position in the country's government but stepped down to pursue theological studies. Holger the Scholar is worth remembering, but his father Jørgen Rosenkrantz and grandson Iver Rosenkrantz deserve more than just a passing mention. They were both heads of government, in the 1590s and 1730s, respectively. Jørgen Rosenkrantz created Rosenholm's splendid exterior and Iver Rosenkrantz converted the inside into baroque style in about 1740 and bought many of the furnishings. Rosenholm is therefore as much the home of heads of government as the home of a theologian. "